Enjoy some fun in the sun with our quick and easy appetizer. The classic veggies and dip appetizer has never tasted so good! 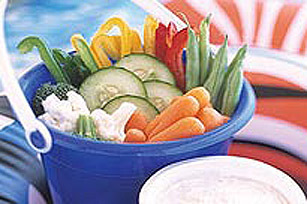 For a fun way to serve kids' favorite vegetables and dip, place vegetables in a plastic wrap-lined, clean pail and serve with Philadelphia Ranch Dip on the side.